Now, I have done a TV Shows Recommendations post before and I would still highly recommend checking out my previous post here. However, over that time there have been some AWESOME shows that I have newly discovered or either rediscovered. Let me know in the comment which show you are most keen to check out and leave me a recommendation for one of your fave tv shows in the comments below! So I'm just going to break out with some of the more grittier hard hitting TV shows first. So if you don't have the knack for mystery, questioning and generally TV shows that will keep you questioning the validity of what you have just seen. 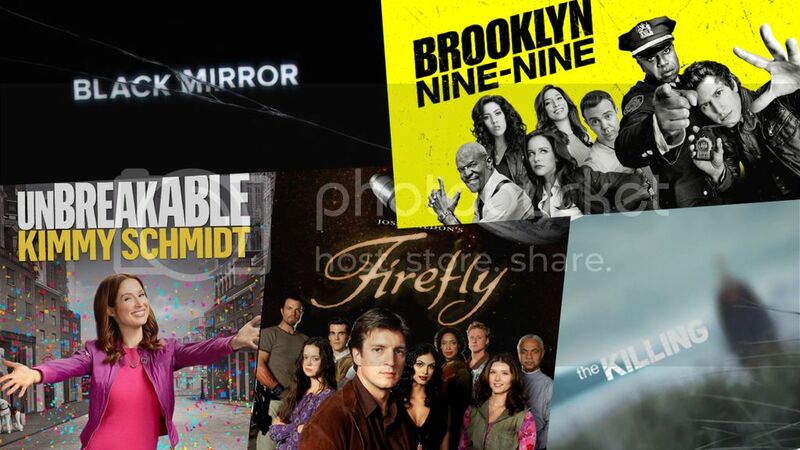 In addition to keeping you up all night, then I suggest skipping these first two TV shows. In all honesty I haven't even finished the third season of this series. I'm only about 2 episodes in as each episode often leaves me in a state of questioning and I find that I often have to switch to something lighter. This show is even described as todays Twilight Zone as it addresses topics that are relevant to todays technologically revolutionary state. It's also a loose interpretation that displays where todays society could be ending up in the future. So I think it's a great science fiction interpretation of where our lives go. They are quite lengthy episodes and the interesting thing about them is that you don't need to watch them in succession. As each episode starts fresh. So you can pick any episode from any season to start and come back to whenever you would like. It's no secret that I love a good dark television show. As I am a huge fan of Criminal Minds! I think it is sooooo interesting determining an individuals motives as to why they choose to do what they have done. The Killing is something on the top of my list of TV Shows. I've often described it as somewhat How To Get Away With Murder esk. As the show begins by centering itself on the homicide of a young girl. We look into the motivations behind three sets of characters the family of the victim, a politician and his team who have to deal with the implication of her death and of course the detectives who are working the case. But be warned it's not a show where you discover the culprit behind the murder within a couple of episodes (and it does this on purpose). For the idea of spending more time with the characters motives and the reasons why they do specific things, I think helps flesh out a more all rounded character and creates a better TV show. Moving into something lighter. The show lead by the quirkiness of someone such as Kimmy Schmidt, I think reflects a little bit of someone in all of us. Despite going through one hell of an unfortunate situation. (Being trapped in a bunk by a cult leader, who has convinced a group of girls that the apocalypse has arrived). Kimmy herself decides to look at the brighter side of life and embrace all the possibilities it has to offer, and I think we all want to see someone with that much openness to life. I think it's interesting how as kids we find excitement in the littlest things, and for her character she has pretty much been stuck in that state of mind, except she is now grown up and everyone around her is telling her to act her age. But she refuses to do so. From the creators of Parks and Recreation comes a half hour comedy show held in the New York Police Department. I think this is an example like Parks and Rec of a workplace we wouldn't want to see in real life (because lets face it, the amount of work they do in relation to their jobs is quite questionable). However, at the same time it's a whole lot of fun to watch and the antics the cast gets up to on a episodical basis gets better with every episode. So when you need a break from all the dark shows I've recommended I suggest squeezing in a couple of episodes of this show to remind you of how serious life doesn't have to be. I am a huge science fiction nut as you can tell with my obsession for Doctor Who (where are my Whovians at ??? ~straightens bowtie~) So of course I had to suggest something science fiction based. I could easily watching this show on repeat and with the short one season it had on air, for TV addicts it shouldn't take long to get through. Airing in 2002, the show may be a little be outdated by today's standards in terms of graphics and technological advances. But I find that science fiction's strength is always in its openness to a world of possibility in the different storylines and characters that aren't often found in a real world TV show setting.